Perhaps the most important benefit of systems thinking, as it relates to our way of thinking, is that it lets us grasp the notion that a lot of things in the world that seem immutable actually aren’t immutable—they’re just kept that way. “By what?” You might ask. Our experiences of who is “a runner;” who has “a runner’s body type,” etc., are no exception. 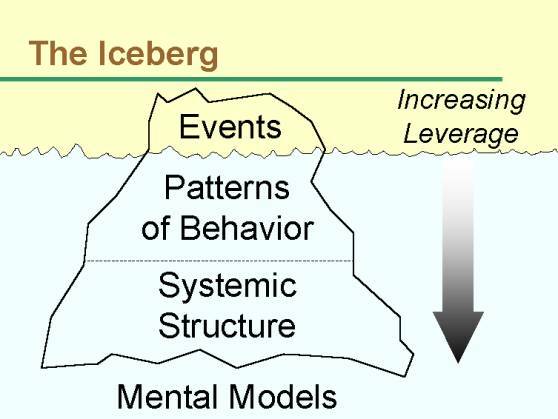 I liken the relationship between systemic structure, patterns of behavior, and events to how the shape of the rocks under a waterfall affect the flow of water over them. The first time that water goes over a waterfall, its flow achieves certain twists and turns. However, as water continues to go over, we see that the same patterns recur over and over in the flow. Although no water droplet will ever take the same direction twice, a pattern appears. In other words, when someone says they “just aren’t” a runner, their assertion is misleadingly essential: there is a series of reasons for why they aren’t a runner. (As I’ll discuss in a bit, it’s highly unlikely—to put it lightly—that any human doesn’t have running in their DNA, figuratively and literally). Now, I don’t mean to imply that everyone as they currently exist can be a runner right now. For example, a newborn baby isn’t physiologically prepared to be a runner, due to a wealth of obvious reasons. Let’s call this “time 1.” But when that baby has dedicatedly creeped and crawled for the first few years of their life, and has been allowed to stretch their present physical boundaries in dynamic play, that child has arrived at “time 2”—and their body is quite capable of running. The fact of the matter is, human running has certain requirements. One such requirement is the capacity to engage all of the systems of the body (and not just some systems) in a dynamic conversation with the force of gravity. But thankfully, our species has evolved for about a million years, or so, around that idea. Predicated on it are the parts of our genetic blueprint that are most generalizable. I’m certainly not talking about “body type,” or “BMI”—if such things exist outside of the present systemic structure of westernized society. I’m talking about the kinds of things that Daniel Lieberman & Co. suggest are so important for human endurance running: an upright posture; a massive nuchal ligament; a capacity to develop a density of sweat glands far beyond any other animal; a brain that lets us engage in recursive symbolic manipulation (thinking about thinking). Those thing, which are much more centrally important to human running than body type, are shared by basically everyone. (I say basically to account for the sad reality that exposure to teratogens, nutritive deficiency, and physical damage may create very significant deviations from these shared traits). I don’t believe that endurance running is “inherently” human. I think that the enterprise of trying to “define” humanity not only misses the point, but also creates a situation in which bad people have a chance to grab onto the incidence of some particular trait, and marginalize and oppress those who either don’t have it, or have less of it. Throughout my personal research about the biology and cognitive psychology of running (and its systems thinking applications) I have come to think of endurance running as something that the human body-system, in its biomechanical and psychosocial aspects, does particularly well. In other words, endurance running drives the functional paradigm of this particular system: its morphological structure (i.e. shape and size), psychological attributes, and particular cognitive capabilities are the way they are because of and thanks to our evolutionary history as endurance runners. In other words, what the human body and psyche does, left to its own devices—and by this I mean free of the encroachment of biologically, cognitively, and socially oppressive systems—is to move under its own power, on variable terrain, and across distance. What is it about our society—about its underlying patterns and systemic structure—that makes it so that basic mobility and health are markers of PRIVILEGE? Because that’s how it is, isn’t it? This person “just is” a “natural athlete.” That person “just has” “a great constitution.” I’m “just not” “a runner.” Does any of this sound familiar? These “just is” is statements are statements of essence. In this kind of thinking, there is no causal background for why person X is a natural athlete, and person Y isn’t a runner. They just are that way; they have an attribute that is “god-given,” so to speak, without considering that a multitude of forces (genetic, social, environmental, etc.) have shaped person X and person Y in two different athletic directions—and make them remain that way. The goal here isn’t to solve the problem of human mobility and health in one short blog post. This is just a beginning. But as a first step, it is important to debunk essentialist claims about others and ourselves, that do nothing but hinder how far we individually reach into the skies of our personal athletic potential. Furthermore, it is important to recognize this issue as a systemic issue. Type 1 diabetes in children doesn’t “just happen.” There are reasons for why it is so prevalent. Similarly, there are reasons for why injuries in endurance running of all possible activities to get injured in are so rampant. It’s not because someone “is prone to injury”—and they just are that way. Being “prone to injury” is an event in a particular systemic structure (say, a sedentary urban society) that recurs because of a particular pattern of behavior (such as the fact that nowadays, dynamic and physical play in children is severely constrained because of its potential for injury). This pattern of behavior (and perhaps others, such as long work hours, eating a sterile and low-quality diet) creates a statistical majority: 70% (or so) of runners will get injured every year of running. But there is nothing about that runner herself that makes her prone to injury. An abundance of systemic forces acting on her life, shaping it into what it is, make her prone to injury. Insofar as we recognize that what we see on the surface is born of underlying patterns, and of a systemic structure that is buried deeper yet, we have a chance to change it—whatever “it” may be. Truth be told, some of us are locked into our present circumstances by a systemic structure that is, for all intents and purposes, completely solid and intractable. But it isn’t until we’ve dug through the events, past the underlying patterns, under the systemic structure, and into the paradigms themselves, that we’ll know if that is indeed the case. Before that, we just don’t know. It is in these cases that ignorance often manifests as certainty. Once we’ve gone that deep into the iceberg, it will become apparent that certain problems that we thought solvable are not, and certain others that we thought unsolvable have a solution that was right in front of our eyes, right in our blind spot, the entire time. Then, once we’re done exploring the systemic depths of the problem, and we’ve come up with a possible solution, actually getting there becomes largely a matter of stubbornness, as well as a matter of luck. Previous PostRunning quote of the dayNext PostThe human body as a system of suspension bridges: The geometric source of athletic power.